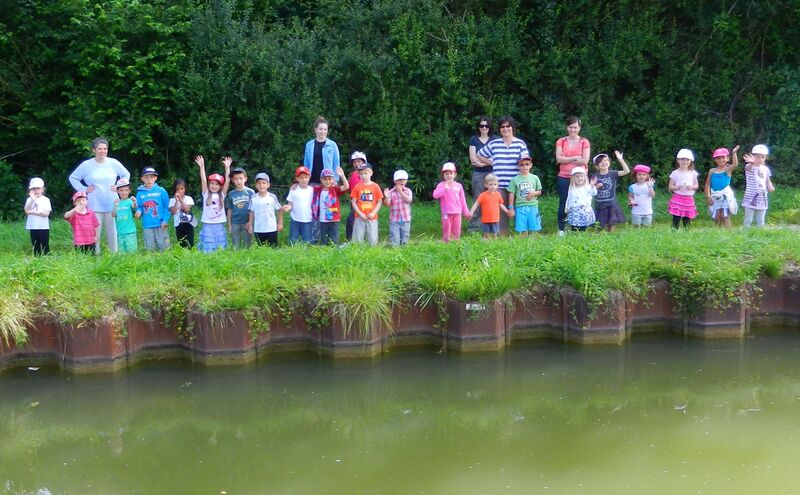 What’s different about this summer, our second summer on the barge in France? Well, last summer was all about living on a barge. In France. Our itinerary looked like we’d dropped a few strands of wet spaghetti on a large map of France. If a twisting squiggle of pasta covered a tidbit of France, we saw it. Otherwise, it didn’t exist for us. We learned about the boat, about moving the boat on the canals and rivers, about not sinking the boat or bumping into hard bits and pieces of France, at least not too quickly. This summer, thanks mostly to Sandra’s limiting the bulk of her reading to brochures, pamphlets, maps and books handed out at every town’s local Tourist Office, we’ve ventured beyond the spaghetti, or at least well onto the parts of the map covered by the spreading spaghetti sauce. Go little, go little GTO. Mustang Sally, ride Sally ride. Little Old Lady from Pasadena. Go Granny, go Granny, go Granny, go. Lord won’t you buy me a Mercedes Benz. And, for Harvey, give me forty acres and I’ll turn this rig around (bizarrely appropriate to a 70-foot barge). Renting a car in France, it turns out, is cheap. For the cost of a fairly average lunch we get a spiffy Renault for 24 hours, available in most towns of reasonable size. 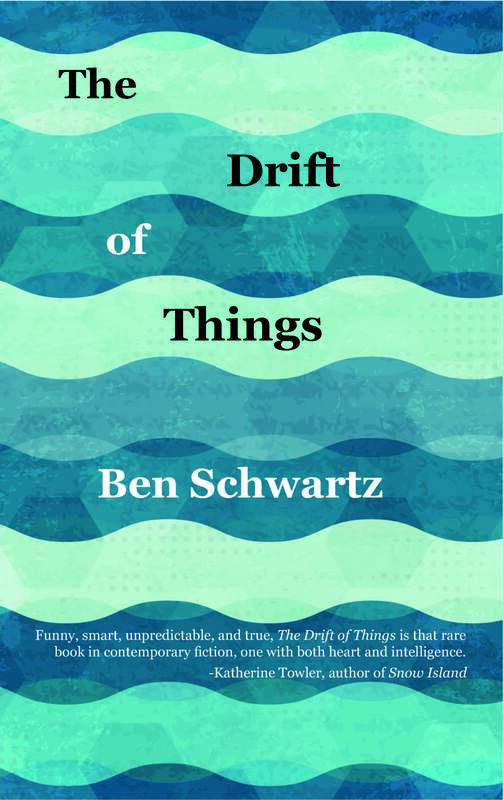 The question, though, has been whether after riding our bikes to get any place more distant than a mile or so from the boat, and not driving a car for a year-and-a-half, whether remembering how to drive would be as simple as, say, remembering how to ride a bike. It was. And it wasn’t. Some barge habits had to be dropped. 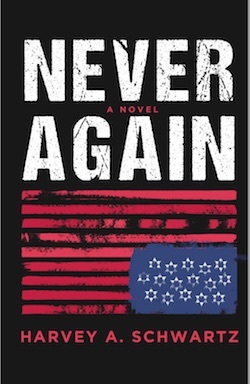 Immediately. An obvious example was that despite the seeming similarity between, on the one hand, standing at our meter-wide wood wheel in the boat and turning the wheel to turn the boat, and, on the other hand, sitting in a bucket seat and turning the Renault’s steering wheel to steer the car, a few minor discrepancies were blatantly obvious. 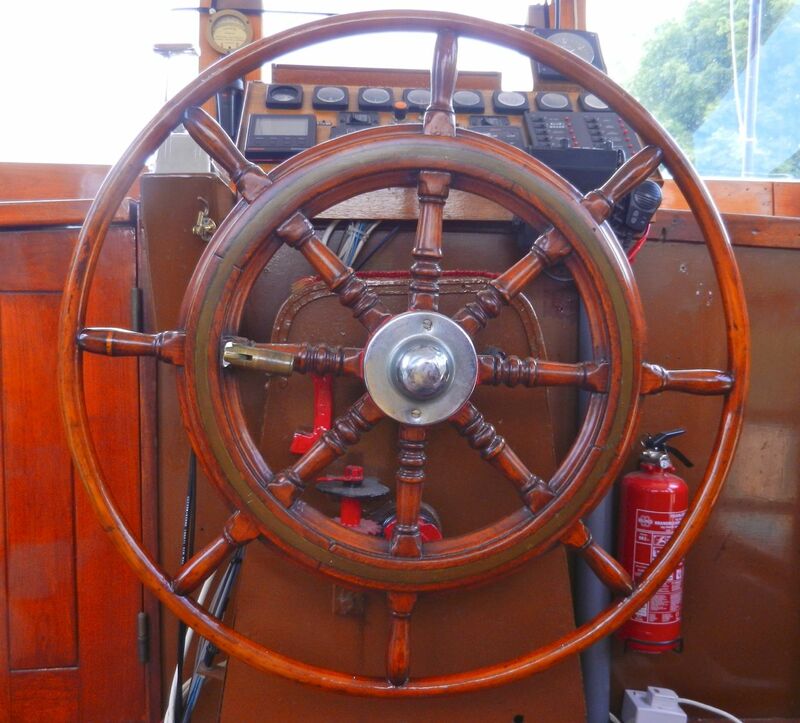 The steering wheel on the boat is connected by twenty meters of heavy, grease-coated chain links running through the bilge to the back of the boat to our barn door of a rudder. Hoop Doet Leven’s wheel doesn’t give sports car agility, but it sure is pretty. Turning the wheel from full-right to full-left involves about twenty revolutions. And patience. You turn the wheel and wait. After it has thought about things for a few moments, the boat considers pointing in a different direction. Sunflowers (which are called, appropriately, tournesol, as in they “turn” with the “sun”) also point in different directions and rotate not all that much more slowly than the barge seems to at times. Not so, the Renault. Turn the wheel and the car turned. No messing about. And as with turns, so with straight. Point the barge down the middle of the canal and should conversation with the person sitting at the wheelhouse table behind you ensue, then eye contact, long and intense, is reasonable. Stepping from the wheel to answer a call of nature is not beyond the possible. Again, not so the Renault. Things happened so quickly in the car. No time for gawking at the countryside, or leaving the wheel to rummage in a backpack for the camera when a field of photogenic goats – or school children – drift past. Hiking school kids wave at the barge. There’s no time to reach for the camera in the car for sights like this. For hair raising thrills and chills, we drove fast, hitting 30 miles an hour at times. Highways – France has quite the network of fast, efficient and expensive toll highways – were beyond our risk level. Too much culture shock to move that quickly. We stayed on secondary, tertiary, all right, dirt roads. Meeting an oncoming car on a one-lane road is not all that different from meeting a commercial barge on a narrow canal. You do the dance of two fat men meeting in a narrow hallway. Medieval road planners didn’t design with heavy traffic in mind. French drivers are the best in the world. Just ask one. In fact, ask the guy sitting three inches from your back bumper on a twisting country lane. As soon as you pull over to let him pass, his twin brother appears and grabs your bumper. The French drive as if they are jammed in the peloton on the Tour de France, all drafting on the grandmother in the lead, who is driving at the speed limit. But driving in France was not all that difficult, not at all … except for the dreaded priorite a droite, the priority of the right law. There was a time, not all that long ago, when a wagon filled with hay drawn by a hot, tired horse rolled slowly toward a cross-road. At the same time a wood gatherer returning from gathering wood in the forest led his donkey, loaded with fallen branches, toward the same cross-road. Pierre, with the donkey, would see Jean Claude, with the horse and wagon, approaching on his right. They would waive at one another. Comment on the hot weather. Arrange to meet later for a pastis at the bar. Then Jean Claude, being on the right, went through the intersection first, waving farewell to his lifelong friend. That is priorite a droite. The vehicle on the right at intersections has right of way. Fast forward to a few weeks ago. As we drove, slowly, through towns and villages on the through road, from every narrow lane and way, at least every one ON OUR RIGHT, out shot Peugeots, Renaults and Citroens at full speed, leaving rubber as they turned left or right, eyes straight forward, confident and assured that, BEING ON THE RIGHT, they had priority. This archaic rule of the road is supposedly being phased out. Supposedly, we say, because there are no signs indicating where it is in effect and where it isn’t. And when you stop to allow the car on your right to proceed, you will immediately be informed that this is an intersection where everybody knows that such a silly old law was abandoned years ago. The driver on your right, being of the old school, will naturally take advantage of your ignorance and shoot in front of you. Madam, who is driving three inches from your rear fender, however, is stunned by your ignorance and jams both elbows on her horn as a gentle lesson for you. Otherwise, driving is no problem. 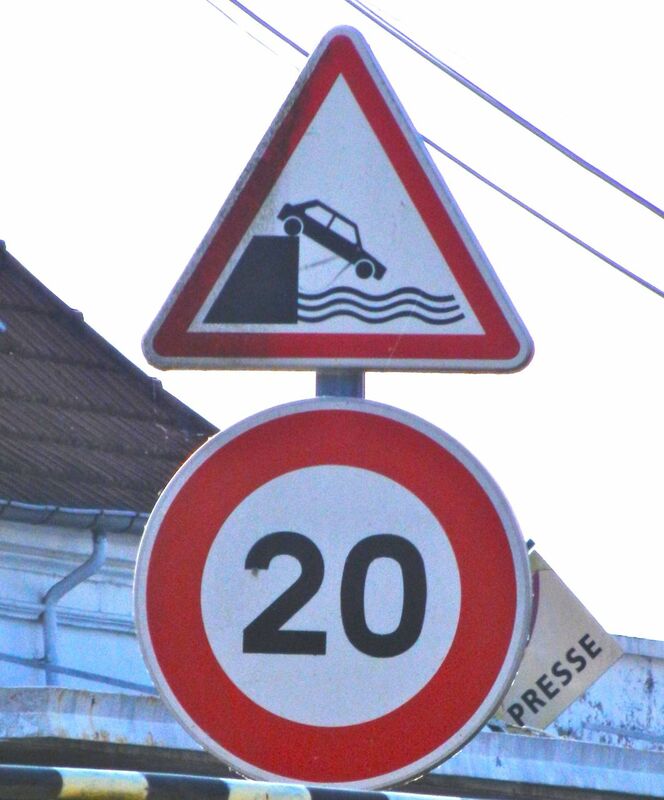 Without this sign we would not know that it is forbidden to drive into the canal, at any speed. We rented the car to drive to Noyers-sur-Serein,yet one more medieval town on Sandra’s list of the Hundred Most Beautiful Towns in France, and to Chablis, a town whose name says it all. Noyers was too-Disney-pretty and, horror of horrors, filled with Americans, as in “Howie, French beer gives me gas why don’t they have lite beer here.” Walking outside town, climbing a series of stone stairs through the woods, though, we came across Noyers’ reason for existence, the former fortified chateau, built in the Eleventh Century by the Duke of Noyer (“noyer” means “walnut” and, unfortunately, Google translation goes on at length about the Dukes of Walnuts, a far-from-impressive title, and their “Walnut Castle”). Only a few tumbledown walls remain from what at one time was an impressive fortress. When we reached the top of the stairs, however, we heard birds chirping and a constant tink tink tink tink sound. We walked through the trees and there, at the foot of a castle wall, was a sunshade and a group of young men, sitting at work benches, turning round rocks into square rocks by chipping away with hammers. Tink tink tink tink. It turned out that they were archeology students working on restoring the castle. The stones are donated by the same quarry that supplied the original stones a thousand years ago. We closed our eyes, listened, and imagined a thousand stone workers tink, tink, tinking away for decades to build the original castle. Our memory of Noyers will be the sound of tink, tink, tink, not complaints about French beer. 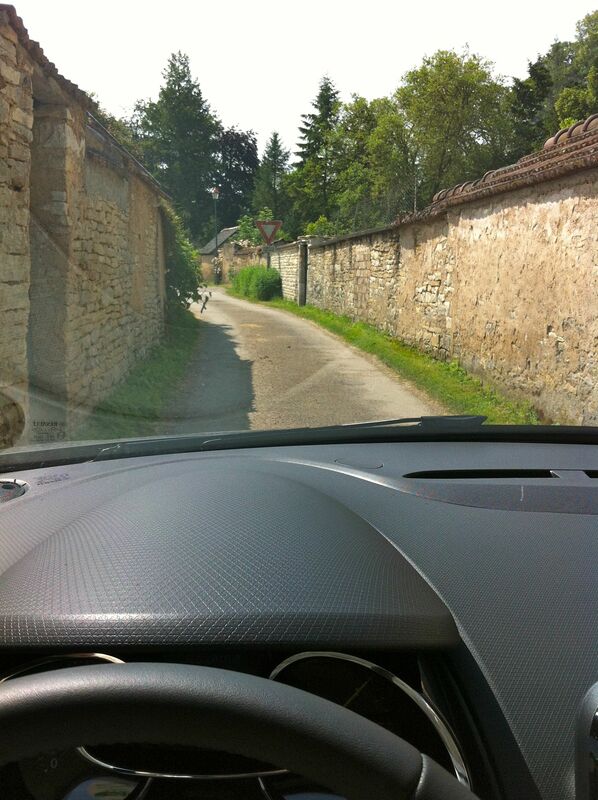 On we drove to Chablis, another stop on the French country tourist tour. And on our wine shopping expedition. And, most importantly, on Sandra’s quest for a monthly bath tub. We booked ourselves into a hotel, spent the afternoon tasting wines – and buying a case or two – then returned to our hotel room for our second lesson in French culture for the day, after watching how restoration of a castle was part of archeology training. The second lesson was tres Twenty-first Century. The hotel room had a television. (The barge has a TV, one we bought in our first week on board, but none of the plug-in antennas we’ve bought brings in a signal and our satellite dish hasn’t worked since we stayed up all night to watch Obama’s reelection – obviously a Republican device – so we only use the TV to watch DVDs and video cassettes). French TV is mostly sharply dressed men and women discussing events in Mali or Marseilles, French soap operas, some dubbed American shows (The Simpsons seems to be on the air constantly, how French), and children’s cartoons. We alternated between watching children’s cartoons and Harvey’s favorite adult cartoon. And there was our second lesson in French culture. 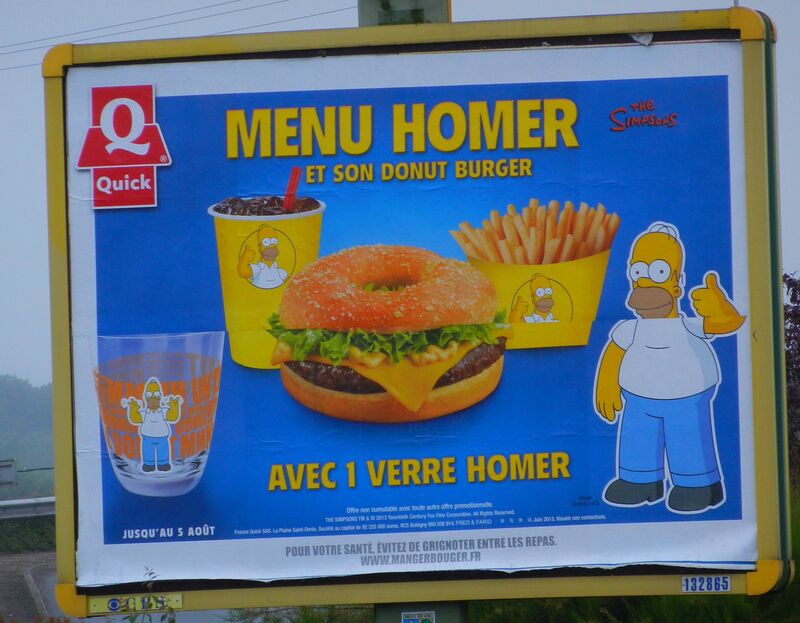 Homer, an American import loved by all in France. The cartoon was about a collection of vegetables who ran a pizza shop and spoke in the squeaky voices of cartoon characters. They mostly chattered back and forth, a cute young carrot girl and a vaguely human boy who was some sort of generic veggie. A customer arrived and ordered a Special Pizza. Oh, they were so excited. Then disaster struck. They were out of Special Pizza Sauce. What would they do? The veggie boy leapt in the air and spun ferociously as the music reached a crescendo. In the best tradition of the action hero worldwide, in the steps of mild mannered Clark Kent actually being Superman, of Mr. Mellow Bruce Wayne becoming bold Batman, veggie boy stopped rotating and emerged as … Super Server. Yes, carrot girl screamed in awe, Super Server, Super Server you are here to save us. All in French, of course. Now, can there be another country on the planet where Evil is banished by the intervention of the World’s Best Waiter? Where the Waiter is the action hero, not the Hero’s nerdly alter ego? Is there the slightest possibility American children would rush out to buy action figures of a waiter? Yet here we were in prime after-school television time watching the Adventures of Super Server. How did he save the day, you may ask. Well, Mr. Evil turned out to be a giant tomato who was trying to force carrot girl to cover her Special Pizza with ketchup. No, never, a thousand times no, she cried, just as Little Nell spurned Snidely Whiplash until she was rescued by Dudley Do-Right of the Canadian Mounties. Super Server flew out the window and returned in moments with armloads of dew-covered fresh tomatoes and pockets filled with herbs and spices. The Super Special Pizza was truly super special, the restaurant was saved and carrot girl’s heart throbbed for Super Server. 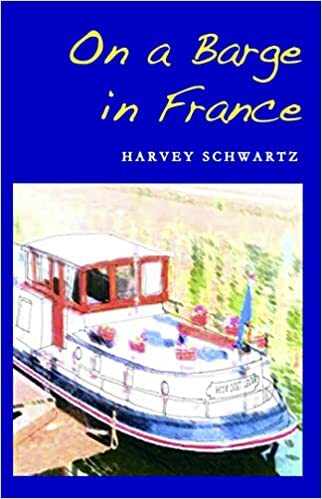 Having spent a week on a barge and undertaking numerous road trips through France, I found this piece particularly amusing and accurate. On narrow country roads, one way to tell whether the driver in front of you is French or not, is by his tail lights. If they never come on – it’s a French driver. 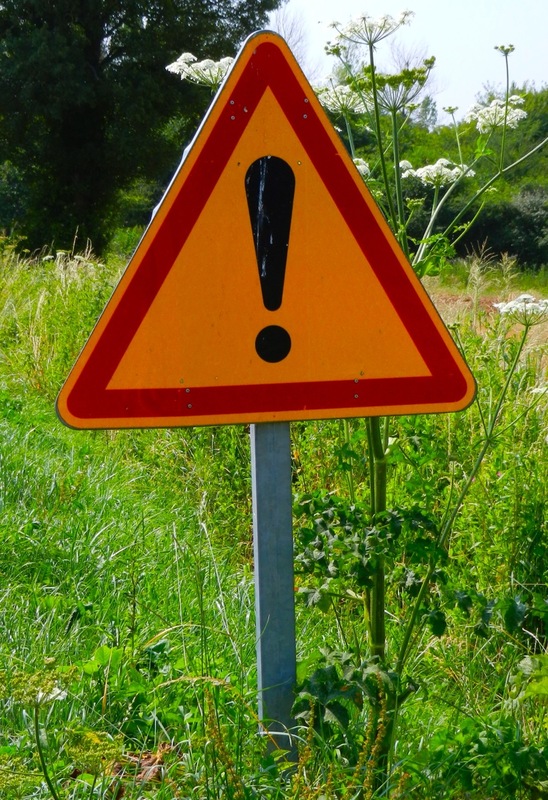 If they come on at the slightest curve in the road – it more than likely is NOT a French driver! Absolutely love your blog, love your writing. Any chance of daily posts? OK, twice a week? Well then, what about weekly? Superb. Have a wonderful time!! May you bask in wonderments all summer, and never encounter a greenhead—the world’s supply of which we have attracted to Ipswich yet again. 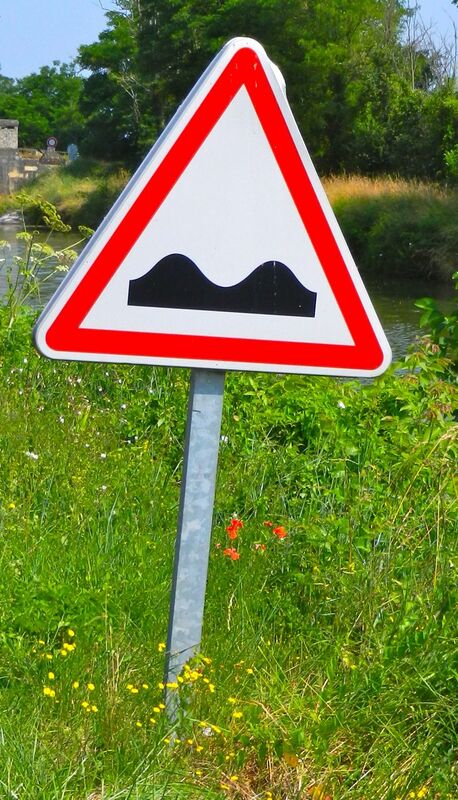 My favorite French road signs were a pair in St. Brieuc, in Britanny. On the same signpost, the top sign said, Toute Directions. Just below it was one that read, Autres Directions. But sacre bleu! French television elevating pizza to a place of honor! Pizza!! !